Who doesn’t want to be rich in video games? 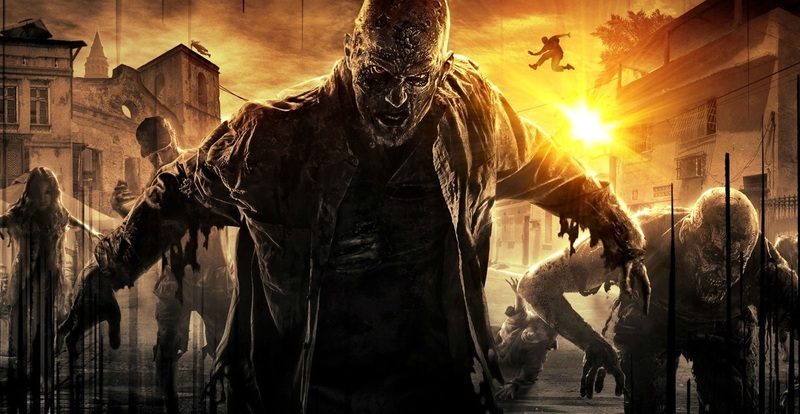 Dying Light is a survival action game, where finding items and money is the main key to stay alive. Without proper equipment, food and crafts there’s a slight chance that you make it through the chaos of the city. 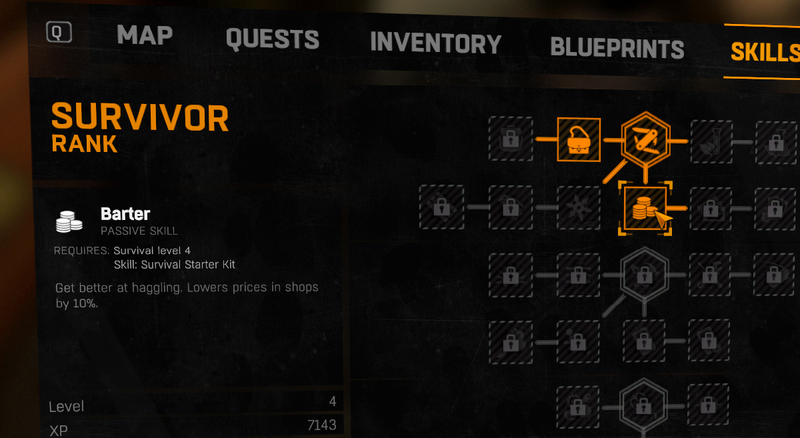 The following guide contains all the steps towards a successful monetary experience in Dying Light. Learn how to make easy and quick money without cheating. If you’re too impatient however, there’s also an option for you which involves exploiting. The basic way of making money in almost every game is through looting corpses. Dying Light is no different in that sense. 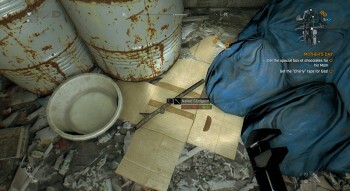 However, as a survival game, the game mechanics encourage players to find items instead of looting them. Looting enemy bodies won’t make you rich but it surely helps. They normally drop small amounts of cash and occasionally, some crafting components. The best way to find items is to look around and scavenge every place you pass by. Permanently spamming the Q key will help you find lootable objects. This is a very reliable option and it will assure you won’t miss any scavenging opportunities. There’s no limit for this activity, you can take whatever you want and most importantly, you can find all types of items – cash, food, weapons, weapon upgrades, trophies, utilities, crafting components, among many others. 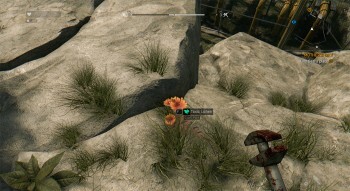 The wild life can be very profitable in Dying Light. Common plants might not sell for high prices but there are a few rare species that will make you rich if you manage to collect a decent number of them. Besides, some traders will make a limited time offer if they’re running low on herb supplies. For example, toxic lichen is widely wanted and it can sell up to 100$ per plant. One of the best ways to make tons of money is to collect and sell valuables. 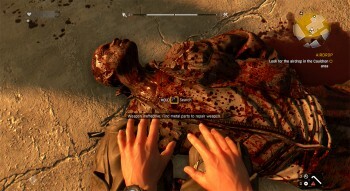 In Dying Light, items that have no real use for combat are called valuables. These items are extremely expensive due to their rarity and high demand. So, every time you find coffee, cigarettes or even jewelry, remember that you’ve just put hands on Dying Light’s gold. These items normally sell from 50$ to 500$ each. 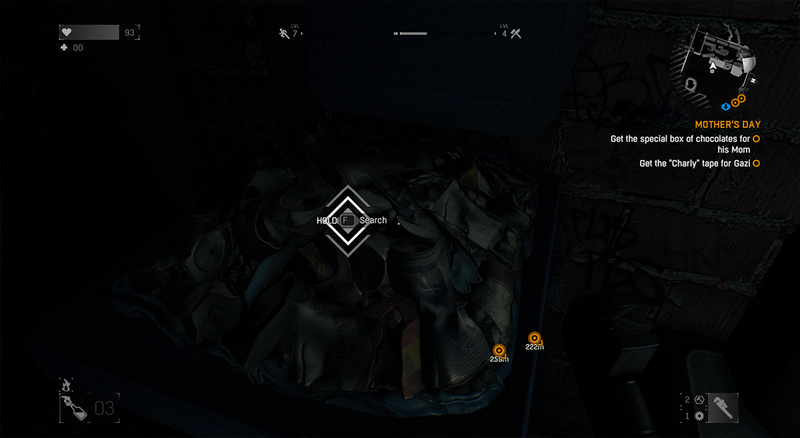 There are lost object everywhere in the open world of Dying Light. The question is, can you find them? If you look closely, there are normally single items or even packs laying in the ground. Collect them all, since they always end up being useful in some way. Either for personal use or to exchange for money. For example, certain weapons, depending on their color, can sell for a few hundred dollars. If you manage to collect a huge variety of crafting components, do not sell them. Instead, try to make new items by combining them. Why? Crafted items usually sell at higher prices than their components. Besides, you can make use of them. For example, instead of buying medkits, which sell for around 80-100$ each, you can craft and use them, saving that same amount of money. Almost every trash bin contains a search option. This doesn’t mean they have valuable items ready to be picked. Instead, it means there’s a chance you find something useful among the trash. You can find all sort of objects through this scavenging process, from metal parts, to cash and strings. Broke weapons might seem useless, they cannot be repaired anymore and they do basically no damage to enemies. so, what to do with them? Simple, keep them in your inventory and wait until you meet a trader. Afterwards, you can simply sell them. It might not be an extraordinary way to make money but at least they’re worth something. Another way to make money indirectly is through saving lots of it. Level up your survival tree and skill the Barter (lvl 4), Hungler (lvl 8) and Hard Bargain (lvl 11). These passive skills will lower the shop prices up to 20% and increase your selling values while trading. This way, the more valuable your items are the higher they will sell. You can get additional abilities in the survivor tree that will increase directly and indirectly your money gains. Increasing your inventory up to 8 more slots, Backpacker (lvl 3) and Master Backpacker (lvl 6) skills, will allow you to carry more items, thus selling more at once. There are other three skills that will increase your repair rates, crafting production and looting chances – Crafting Expertise (lvl 5), Lucky Repair (lvl 7) and Nimble Hans (lvl 10). Challenges are medium-hard quests that proposes bizarre challenges to players. Things like proving yourself or helping a cinematographic director filming real zombies in action. 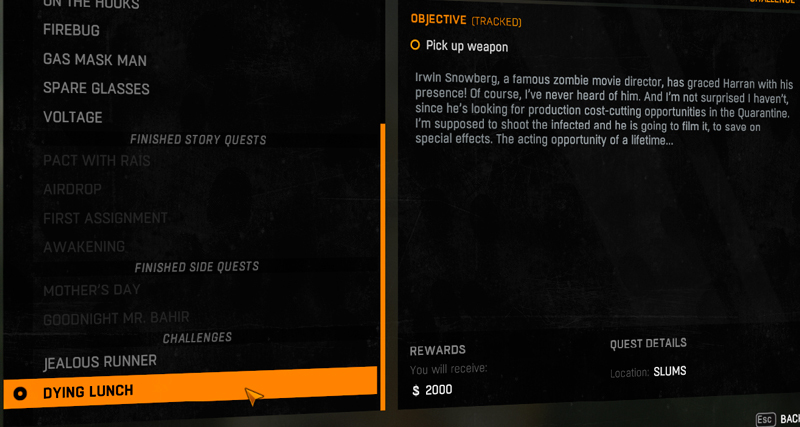 These quests do not award any experience but it gives generous amounts of money, normally a few thousand dollars each. The ultimate method to become rich in a few minutes it to exploiting and make an endless number of weapons. If you acquire the melee throw skill, available in the power tree, you’ll unlock the ability to throw your weapons. Choose a valuable weapon and throw it using the skill, right after you do it and before it reaches the target, open your inventory and unequip and drop the weapon. You’ll find both weapons, the thrown one and the one you dropped in the floor. Pick them up and repeat this process as many times as you want. Then you just have to find a trader and sell the copies.